In a first attempt on an airfield, the record-making vehicle even topped the 200km/h mark – the speed it had to reach to earn the title of the world’s fastest motorhome according to the Guinness Book of Records. The measured speed was 207km/h. But that’s not the end of the story as Hymer and Goldschmitt have obtained approval for a record attempt in the spring on the test track in Papenburg, Northern Germany. Here at Caravan Guard, we obviously wouldn’t encourage our customers to travel at such speeds just to get the best pitch on the campsite. 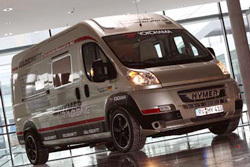 However, if you’re looking at improving the performance and economy of your motorhome through professionally installed engine remapping or chipping, we can provide insurance cover without any additional motorhome insurance premium providing engine BHP is not increased by more than 30%. That said it is still important to make us aware of any such modifications.